It has been an awesome week for The Kut. 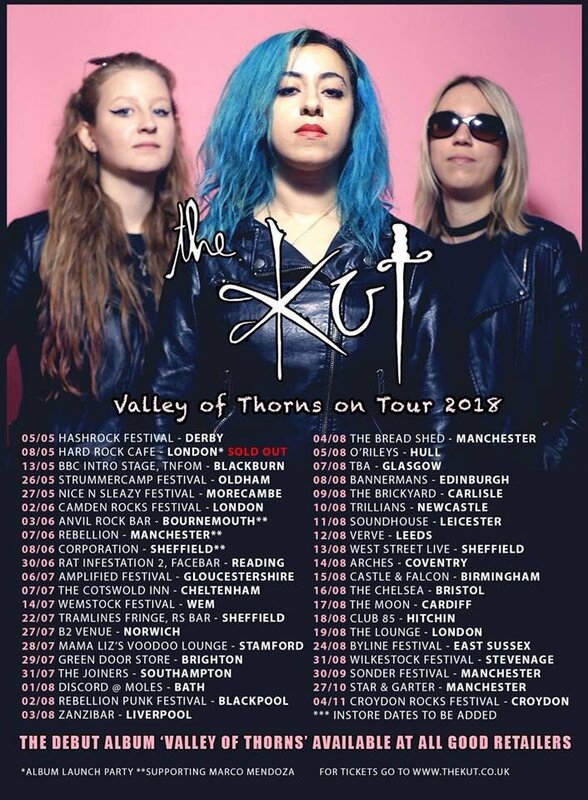 Fresh off the back of their album "Valley of Thorns" Reaching #7 in the UK Rock Albums Chart, #6 in the UK Independent Album Breakers Chart & #18 on the UK Independent Albums, The Kut's have released new single 'Hollywood Rock n Roll'. The girls are playing the BBC Introducing Stage in Blackburn tomorrow with BBC Introducing Lancashire (May 13th), are on Planet Rock’s "Ones to Watch" next week (w/c May 14th) and will have Live session on Total Rock this week and numerous plays on Kerrang! Radio. Rock category Finalist of the UK Songwriting Contest 2017 and Semi-Finalist of the International Songwriting Competition, The Kut, is the alter-ego of multi-instrumentalist and PhD Graduate, Princess Maha. Live, The Kut is a three-piece, featuring Diana Bartmann (drums) and Stella Vie (bass / BVs). Active on the UK and European alt.rock scene, festival performances have included Download Festival, Camden Rocks Festival, Rebellion Festival, Hard Rock Hell, Glastonbudget, Nice N Sleazy and Strummercamp among others. Meanwhile, tours have spanned the UK, Italy, Czech Republic, Germany, Belgium and the Netherlands. Voted into the winning spots of the MTV Brand New Unsigned Poll for 2014, subsequent EP releases and tours gained support from - deep breath - Planet Rock, Kerrang! Radio, The Guardian, Metro, Scuzz TV, Kerrang! Magazine, Big Cheese, BBC Introducing Lancashire, Metal Hammer, Q and Classic Rock, AXS TV, MTV-U USA and many credible independents. 2017 was a significant year for The Kut. They featured as one of Kerrang! Magazine's Breakthrough Acts of the year, while ‘The Kut EP' was released on 500 limited edition picture discs for Record Store Day 2017, also featuring at number 4 in Kerrang! Magazines Top 10 Record Store Day Releases, alongside Baby Metal and Gerard Way. 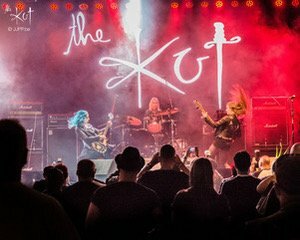 The summer saw The Kut playing over 50 UK mainland dates, and the year ended with the band claiming the Number 1 Spot in the Beyond 50 Promotions Top 50 Under the Radar UK Bands. 2018 has seen a worldwide record deal announced with Cargo Records for the long-awaited debut album, ‘Valley of Thorns’. Produced by James LeRock Loughrey (Skindred / Def Leppard / White Zombie / My Vitriol) the debut sees some of the live favourites heard on The Kut tours, and is due for release on Friday 4th May (May 18th North America). Reactions have been incredible across the board. The latest single ‘Mind Games’ has been premiered on Kerrang! Radio by Johnny Doom, played out by Sean McGinty at BBC Introducing, Total Rock Radio, Hard Rock Hell Radio and picked up airplay as far as the USA and Australia, with over 90 stations adding the release! This includes 3 chart adds this week for the USA NACC Chart. Meanwhile the accompanying music video is on rotation on Scuzz TV and was premiered online by Clash Magazine. The Kut will be taking ‘Valley of Thorns’ on tour this summer, hitting the main stages of some of the hottest independent UK festivals, as well as supporting Marco Mendoza (The Dead Daisies / Thin Lizzy / Whitesnake) on three dates of his incoming tour. As if that wasn’t a busy enough schedule, The Kut is also soon to announce their three week headline tour across July and August! Rock fans - watch this space! .